The Florida socialite whose report of harassing emails from Paula Broadwell ultimately led to the resignation of CIA director Gen. David Petraeus forged close ties with top military and intelligence officials in Tampa, hosting lavish parties at her waterfront mansion and earning accolades as an "honorary ambassador" to the military and an honorary consul general for Korea. 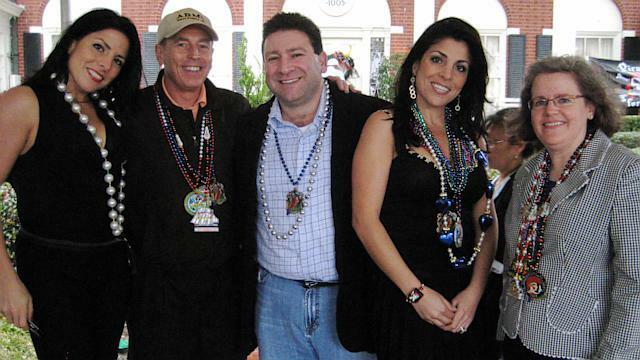 But detractors say that Jill Kelley, 37, is a social climber whose lavish lifestyle is now threatened by millions of dollars in debt and possible foreclosure on her home, and who tried to exploit her connections, perhaps even enlisting Gen. Petraeus in her sister's bitter child custody fight. Jill Kelley and her twin sister Natalie Khawam grew up in the Philadelphia area, daughters of a Lebanese immigrant couple who owned a local restaurant. Jill and Natalie would appear together on a 2003 episode of a Food Channel program called "Food Fight," in which they dressed in designer clothes while cooking alligator in a cook-off against two brothers. After Kelley and her husband Scott, a cancer surgeon, moved to Tampa, Khawam came to live with them and their three children in their $1.5 million home on Bayshore Boulevard. In Tampa, Kelley volunteered her time to support the military, planning and hosting charitable events for CENTCOM, the Defense Department's Central Command, which is based at Tampa's MacDill Air Force Base and has responsibility for directing operations in Iraq and Afghanistan. Kelley, her husband and her sister Natalie became friendly with major players, including both Gen. Petraeus and Gen. John Allen, commander of the International Security Assistance Force in Afghanistan. "Jill is known as a gracious host, a vivacious individual," said Aaron Fodiman, editor and publisher of Tampa Bay Magazine. Kelley's social efforts on behalf of the military earned her the unpaid title of "honorary ambassador" to Coalition Forces in Afghanistan, and she was also named honorary counsel for South Korea. In a statement, Kelley and her husband Scott said they are close friends with the Petraeus family. The families have spent the holidays together several times over the years and celebrated Christmas together last year, according to Petraeus' daughter Anne's personal blog. "Our friends from Tampa (the twins Jill and Natalie, plus Jill's husband Scott and their three little girls, as well as Natalie's 2-year-old son John) were in town and came over for an afternoon feast and presents at our place," she wrote in the blog. "There was no question they were friends," said Fodiman, "and no reason why they wouldn't be friends." See the timeline of the Petraeus/Broadwell affair HERE. This summer when Kelly received anonymous e-mails accusing her of flaunting a friendly relationship with military brass in Tampa, she called the FBI, which traced those e-mails back to the computer of Paula Broadwell, co-author of the Petraeus biography "All In." Investigators are said to have found emails in Broadwell's inbox that pointed to an intimate affair with Petraeus. Petraeus announced his resignation as CIA director on Friday. After the media spotlight turned from Broadwell to Kelley, questions about Kelley's lifestyle and her ties to the military surfaced. A U.S. official described Kelley as a "nice, bored, rich socialite" who drops "honorary" from her title and tells people she is an ambassador. The personalized license plate of her Mercedes trumpets her status as an honorary consul for the Korean government. In a 911 tape from this past weekend, Kelley can be heard telling local police that alleged trespassers on her property need to be removed because of her diplomatic status. "I'm an honorary consul general," explains Kelley, "so I have inviolability, so they should not be able to cross my property." In a statement Tuesday, the U.S. State Department emphasized that Kelley has no official diplomatic role. "She does not work for State," said a spokesman. "She has no affiliation with State." Kelley and her husband Scott have also had to grapple with financial problems. They have been sued at least nine times. The couple faces foreclosure on their waterfront mansion and on an office building they own. Court records indicate that the Kelleys owe more than $2 million on the office building. The Kelly home also served as the office for a charity she and her husband set up for cancer victims that spent tens of thousands of dollars on travel, meals and entertainment. The FBI has now uncovered "potentially inappropriate" emails between Gen. Allen and Kelly, according to a senior U.S. defense official who is traveling with Defense Secretary Leon Panetta. The department is reviewing between 20,000 and 30,000 documents connected to this matter, the official said. The email exchanges between Kelley and Allen took place from 2010 to 2012. The U.S. official said the emails were "innocuous" and mostly about upcoming dinner parties and seeing him on TV. Allen denies he was involved in an affair, a Pentagon official said. An intermediary for Allen told ABC News that Allen and his wife are friends with Kelley and her husband and most of the emails were sent from Kelley to Allen's wife. ABC News has learned that Gen. Allen also received an anonymous e-mail traced to Paula Broadwell, claiming Jill Kelley was a seductress. Kelley's family is standing by her and denying any untoward allegations and insinuations. "It is a shock," Kelley's brother, David Khawam, told ABC News' Tampa affiliate WFTS. "We are just trying to find out where the pieces are falling right now." "She is very dedicated to her husband and to her kids," he said. "So, something like this is really pretty much a fluke. So, for anybody to paint her as otherwise is completely wrong." But Kelley and her sister had apparently grown so close to the high-level military officials that both Petraeus and Allen wrote letters on Khawam's behalf in September as she battled her ex-husband Grayson Wolfe for custody of her son, even as the judge in the custody dispute wrote that Kwaham had "severe psychological deficits." In November 2011, the D.C. Superior Court had ruled that Khawam's husband would get sole legal and primary custody of the child. The judge wrote that Khawam "has exhibited an utter disregard for the child's interest" in maintaining a meaningful relationship with his father, that she "has extreme personal deficits in the areas of honesty and integrity," and that she has exhibited a "willingness to say anything, even under oath, to advance her own personal interests at the expense" of her husband, the child, and others. "The court fully expects that Ms. Khawam's pattern of misrepresentations about virtually everything, including the most important aspects of her life, will continue indefinitely," the judge wrote. It is not currently known if Petraeus or Allen knew about the judge's harsh comments regarding Khawam, but the two wrote letters on Khawam's behalf almost a year later in September 2012. Petraeus stated that he and his wife had known Khawam for about three years, getting to know her while serving in Tampa, and maintaining their friendship since then. "We have seen a very loving relationship -- a Mother working hard to provide her son enjoyable, educational, and developmental experiences," Petraeus wrote, according to a copy of the letter posted on Scribd. "Natalie clearly dotes on her son and goes to great lengths--and great expense--to spend quality time with him." A letter from Allen to the court also painted a portrait of a loving and devoted mother who "places the needs of her son above her own." Natalie Khawam is also deeply in debt and filed for bankruptcy in Florida in April 2012. In a document filed with the Tampa Division of the U.S. Bankruptcy Court, Khawam cited $350,000 in assets and $3.6 million in liabilities, including $800,000 owed to her sister and brother-in-law. Her listed personal property included six Chanel purses, a Cartier watch, and a trove of diamond jewelry valued at $50,000, including the watch. The items are in the possession of Khawam's ex-husband, according to the court documents. Khawam has also sued a former employer, Barry Cohen, claiming that Cohen, an attorney, owed her money and failed to take action when she reported sexual harassment. According to the Tampa Bay Times, Cohen wants the court to dismiss the case and fine Khawam $500,000 for a "bad faith" filing. In 2007, the Kelleys and Khawam founded a charity called the Doctor Kelley Cancer Foundation that was meant to conduct cancer research and grant wishes to terminally ill adults. The charity, which the couple ran out of their home, raised $157,000 and spent $157,000 before going bankrupt. About $135,000 went to travel, entertainment, legal fees, office expenses, "automotive expenses," and utilities. The Kelley family has hired attorney Abbe Lowell, who represented John Edwards, and crisis manager Judy Smith, who worked for Monica Lewinsky.